This is the site of the ancient gate into the city walls known as Burgate. The street behind you leading into the city has taken the name. The gate was excavated by the Canterbury Archaeological Trust in 1988. In 597, St Augustine arrived on his mission from Rome, and six years later he became the first Archbishop of Canterbury. St. Augustine's Abbey lies behind the gate that you can see ahead of you, although to get access today you must walk ahead, turn right at the gate and follow the road until you find the Abbey Entrance. 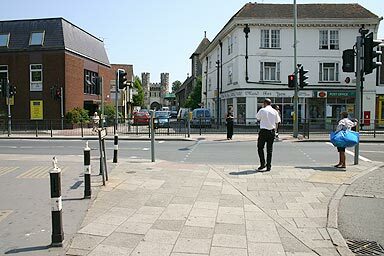 Turn right into St Georges Terrace for a short hop over the Town Walls to bring you at the south-east end of Canterbury's main street. Turn left to walk along Broad Street paralleling the City Walls, until you reach a small gate in the wall that allows access to the Cathedral.